You can now taste & have your very own haskap berries! Our friendly team will be educating on haskaps, our farm, and of course selling our fruit by the half basket. Brace your taste buds! Rosy Farms has a dream of building community. 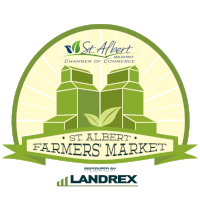 We will be teaming up with two other local Alberta Haskap farmers, growing together to build our industry and to bring healthy food to you! Show up early we are expecting to sell out quickly. Additionally, we will be collaborating with other market vendors to sell haskap products; pastries, cakes, cheese, and natural cosmetics to name a few. Sign up to keep up to date on our partners. Even though farmers market season is months away, business has taught Rosy Farms that success is all about the plan, plan, plan. We have booked the markets, insurance complete, health and safety trained accomplished, booth and marketing writing done, now just needing to print information materials and pick as many fresh haskaps as possible.